Favorable fashion is here. 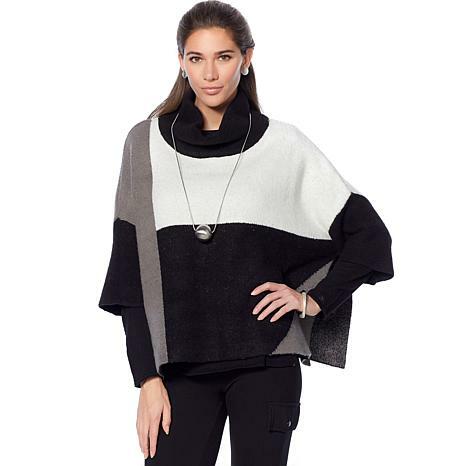 This flattering poncho is an effortless style for the whole season ahead. Top it over leggings, denim jeans and more. I bought this in a medium since I know Marla's clothing runs large/roomy. I normally wear an xl to 1x but in Marla's line, I wear medium to large. I bought the black colorblock and it was very nice. It was thicker than I thought it'd be and too warm for Florida. It looked thinner on the models. It feels nice, like a soft wool and I didn't find it to be itchy at all. For those who need a warm, pretty sweater, this is it! Very Audrey Hepburn style...elevates any pants you have on whether jeans, flatterfit or palazzo pants. 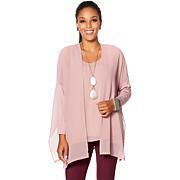 Great fit...I usual wear an xl or 1x in her tops. Carry weight in bust and middle. XL was perfect. Sale price was perfect...I purchased 2! Marla your sweaters and pon hos are to die for. Everytime I wear one I don't need a coat, they are so warm,yet when I go inside I am not to warm. The fit is just right. Makes me feel so sophisticated! Thank you! 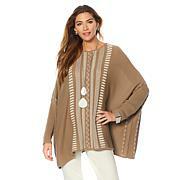 Beautifully made piece that matches perfectly with the faux suede leggings also purchased. Sophisticated outfit.